A few crumbling fragments of concrete at Uisaed Point, Machrihanish, is all the evidence that remains of one of the earliest and most remarkable, yet almost completely forgotten experiments in transatlantic wireless telegraphy. In its day, the station was thought by many local people to be part of a spy plot engineered by the Germans. The first reference I can find to the station is in the long defunct Argyllshire Herald. In its issue of 6th May 1905, under the headline "Proposed Marconi station at Machrihanish", the newspaper announced that negotiations were in progress for acquiring a field on Losset Estate, Machrihanish, on which to build a wireless station. "Machrihanish Bay," said the newspaper, "facing the broad Atlantic, affords excellent ground for an installation of wireless telegraphy." Eight weeks later, readers learned that negotiations were finalised, that work was to start immediately, and that the station was expected to be operational within a further three months. Behind the venture was the National Signalling Company of Washington, USA, who leased six acres of ground from Captain MacNeal of Ugadale and Losset. In their opinion, the site was among the best in Western Europe for their project. Preliminary plans indicated a steel tower 400 feet high (later raised to 450 feet) and three feet in diameter with two cross spars at the top each 50 feet long. 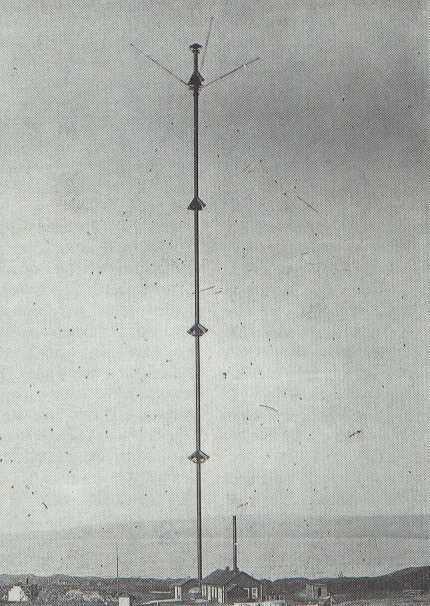 The tower was simply a metal tube built in eight-foot sections bolted together and held upright by guy wires. An internal ladder made it possible to climb to the top. The tower sat on a ball and socket device, and both tower and guys were carefully insulated from the earth. The mast was erected, for its first 40 feet, by hoisting five of the eight-foot sections into place by means of a separate erection pole. Thereafter the mast itself became the erection pole. At each lift a temporary cross-arm was installed, with a pulley wheel at the end, to raise a further section into place. The temporary cross-arm and pulley were moved upwards in similar stages until the mast reached its final height. Each joint was bolted by a fitter, swinging ever higher in a bosun's chair and, as the mast climbed, the web of supporting guys was also put into place. It was this web of guys which held the mast upright. The Forth Road Bridge suspension pillars were erected by a sophisticated development of a similar self-climbing structure. An identical station at Brant Rock on the Massachusetts coast, north of Boston, had just been completed. Both were erected by the Brown Hoisting Machinery Company of Cleveland, Ohio, and the contractor responsible for buildings and cutting the road to the Kintyre site was Neil McArthur of Campbeltown. According to G.L. Archer in his History Of Radio To 1926, the experiment was the brainchild of Professor Reginald A. Fessenden, who foresaw the possibility of developing a smooth continuous flow of high frequency oscillations at that time impossible with techniques then in use. Fessenden, who died in 1932 aged 66, dreamed of superimposing the human voice on this continuous flow in much the same way as Bell had made ordinary electric currents carry it in the telephone circuit. Radiotelegraphy was, of course, still in its infancy at this stage. Only four years earlier, in December 1901, had Marconi succeeded in sending the first signal across the Atlantic from Poldhu in Cornwall to St John's, Newfoundland. The message, if that is not too grand a description, consisted simply of the Morse "dot-dot -dot" signifying the letter "s". In 1904 Fessenden asked the General Electric Company of Schenectady to build him an alternator capable of doing this, but he submitted no design or instructions of any sort. The order was assigned to Ernst F.W. Alexanderson, a brilliant young Swedish newcomer to GEC, who set about making one with a stationary laminated iron armature between two rotating discs. Fessenden disagreed with Alexanderson's idea and insisted that the iron armature be replaced with one made of wood. Unable to convince the professor that his idea was best, the young man gave wav and produced an alternator with a wooden armature. Meanwhile, GEC safeguarded the patent rights of Alexanderson's device and, as things turned out, his alternator proved an epoch-making breakthrough that won him international fame. On the night of 11th December 1905, Brant Rock went into operation with results so successful that even the Bureau of Equipment of the American Navy was amazed. Initially Brant Rock broadcast only over the eastern seaboard of the United States, but its signals were picked up with startling clarity as far away as Puerto Rico. As far as is known, no record remains of the messages these signals contained. We can be certain only that they were in Morse and very brief. "The station stands about 450 feet high, being 50 feet higher than at first estimated. It looks like a badly proportioned chimneystack, having a cap-like arrangement on top all bristling with huge spikes. The whole ground within the boundaries is covered with a network of wires, laid grid fashion in trenches and covered only with some earth, and the ends of the wire are led into a deep trench along the shore at sea level. There are a few houses for the accommodation of the staff. The secrets of the station are being well preserved. The ground is fenced off and no visitors are allowed within the enclosure." On 1st January 1906, Brant Rock made its first exchange of wireless messages with Machrihanish. These would again have been in Morse, as equipment for voice transmission had not yet been installed. Reception was excellent and Fessenden and his colleagues were overjoyed with the results. Messages were sent almost constantly for the next three days, then, quite unaccountably, communication suddenly ceased. Despite constant efforts to get through, the silence continued for three weeks. Baffled almost to the point of despair, Fessenden was on the point of giving up, when, without warning, messages again began to pass loud and clear between the two stations. Triumph was short-lived however, and another inexplicable silence fell. No further signals passed between America and Machrihanish and, on 5th December 1906, disaster struck. After several days of high winds, a severe gale blew up, and at its height, the guys on the West Side of the Machrihanish tower gave way. The tower snapped in two places and crashed to the ground. There were no casualties, but soon afterwards the staff left. What remained of the station was dismantled and Radio Machrihanish was never again heard on the air. It is a pity there is no plaque or other indication of the existence of the station except those few fragments of concrete, close by a well-worn footpath. It is difficult to assess how Machrihanish, in its short life, contributed to the development of radio communication. During his lifetime Fessenden patented around 500 inventions, many relating to wireless, and it may be that several of these were included in later equipment. Certainly his alternator with a wooden armature, produced for him by Alexanderson, played an important role in future international communications. Even in those early days of radiotelegraphy the commercial potential of the medium, particularly ship-to-shore communication, together with its obvious military and naval uses was widely appreciated hence the enthusiasm with which financiers were willing to back men like Fessenden. Among his inventions was the fathometer, a device used to measure the depth of water by means of reflected sound waves. The fathometer, later known as the echosounder, is still used by fishermen to detect shoals of fish beneath their vessels. Perhaps then, there is in the humble fish supper a connection, however tenuous, with the brief life of Radio Machrihanish. The 450-foot mast was a triumph of engineering. The Forth Road Bridge Suspension pillars were later to be erected by a similar self-climbing structure. 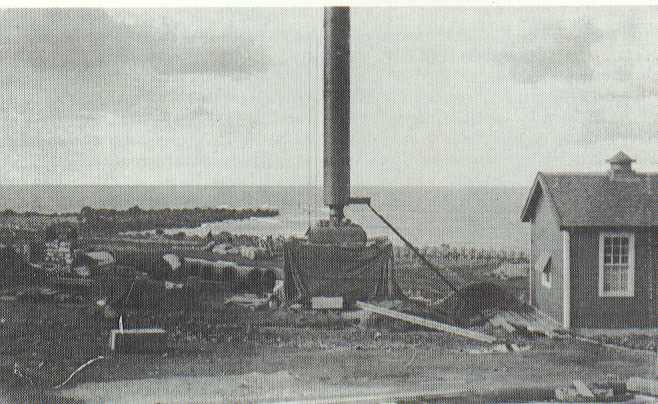 The base of the mast during construction. The ball and socket joint was its main contact with the ground.